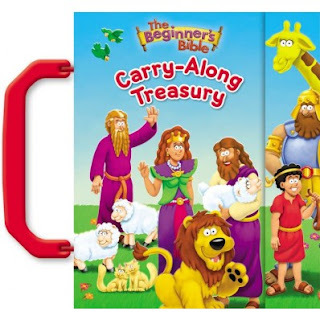 Book Review: "The Beginner's Bible Carry-Along Treasury"
Ok, let's talk about the handle right away because my kids love it! I think all kids are going to love carrying this Bible all over the place because it has this awesome little handle! It is easy to bring it anywhere with the handle! I know my kids will enjoy passing it on to younger one once we are complete with it. As for as the stories go, they are very similar to all the Beginner Bibles. The pictures are bright and capture your attention immediately when you turn the pages. This book is a hardcover book but the pages are normal pages and not a full board book. This book is available for $12.99 on Zondervan.